DSEF launched the Fellows Program to support educational and research efforts to foster a deeper understanding of the direct selling channel and its impact. We now have more than 180 Fellows around the world from a wide range of disciplines – management, marketing, economics, entrepreneurship, sales, consumer studies – and provide them a rich offering of benefits and opportunities. In life and in business there are many unforeseen obstacles. Some of these obstacles can trip us up and cause us to fall flat on our faces. How do you get back up? How do you make the pain of falling on your face go away? How do you keep going? If you have a winning mindset you can overcome these obstacles and use them to motivate yourself to push forward and succeed. Here’s an outline to create your winning mindset. Define your WHY. List three top reasons that you want to succeed. The first reason should be personal and for yourself, the second reason can be based on loved ones and the third reason could be for anything important to you. Make a plan. The plan should include short, medium and long term goals. Then include the how, when, where, who and what. Accountability. Share your plan with a friend or family member that is willing to cheer you on and be honest with you. Even better, get a small group of supportive, positive people who will hold you responsible and keep you on your plan. Make a daily routine and schedule. A winning mindset is built on momentum. Checking off each thing on your to-do list daily will help you see progress and give you motivation to continue. Use visualizations. See yourself and your goals as a campfire. Like a fire you need to keep adjusting it, adding wood to keep the fire going and make it big. Every step makes the fire bigger and sometimes a misstep or problem may diminish your flames. That means you need to adjust quickly and keep the fire going. Make a plan for when you fall. Like with any injury you will need time to heal, to evaluate what happened and maybe some physical therapy to get back to full strength. Have a system in place that you’re comfortable with to help you evaluate and learn from your mistakes. You could keep a journal, take a walk or draw a map. See mistakes as detours that help get you where you want to go more quickly. Perspective. Goals are destinations and mistakes/missteps are detours. You will get lost from time to time and sometimes you’ll speed ahead. That’s the nature of a journey. It doesn’t matter how you get there, as long as you get there. Having patience will give you the long-burning fuel you need to reach your destination. Creating a winning mindset is like being a great baker: it’s part science, part self-confidence and part ingenuity. The science is in the plans you make, the confidence is in the belief in yourself, visualizations and your perspective, and the ingenuity is in finding ways to get things done. Did we leave anything out? What else would you include in a winner mindset? Please share with us in the comments section below! 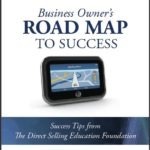 Free e-book “Business Owner’s Road Map to Success.” It has over 50 pages of techniques for everything a small business owner needs to master, from business planning and ethical selling to a success mindset. It’s all there and it’s free for you. To get it, just “Like” our Facebook Page here: http://on.fb.me/KsIN6P Pass it on! Small business owners typically work a lot. It seems there is never enough time or hands to get everything done, and as the owner of your empire, it’s up to you to make sure things get accomplished. Yet part of the reason a lot of people go into business for themselves is so they can have more time to focus on the things that are important to them…things like family, travel, and other lifestyle choices that make life meaningful. Can you have both? Can you enjoy a fulfilling business while also focusing on what’s important? Sure you can! But it takes both planning and mindset to successfully achieve your business goals while enjoying the life balance you strive for. Here are some tips for making it happen. Write your goals down. Make sure that all the tasks you’re working on are helping you reach those goals. If not, re-evaluate the task. Is it worth the time, or would you be better served doing something else? Make sure your goals are realistic. You probably won’t earn a million dollars in a month. Take a look at what others with similar businesses have earned, and set similar goals. It will help you stay on track, without getting discouraged. Your planner is your best friend. Put in the things you want to do for your family, as well as your work priorities. This way you won’t waste time trying to figure out what to do next. Everything is scheduled, and you’ll get things done while also giving yourself time to focus on all the priorities in your life. Have work hours. Your family life will run a lot more smoothly if there is a routine built in. So have regular office hours when everyone understands you’ll be working, as well as times when you’re “off the clock” and are free to give your full attention to other things. Forgive yourself. If you miss a concert or a ball game, there will be others. You’ll waste a lot of time and energy beating yourself up over something you can’t control. Better just to get what you need to done, and then give 100% of yourself the next time you can be there. Your child won’t be scarred forever if you miss something, and neither will you. Involve your family. Make sure your kids understand that your work is important, and how the money you’re earning affects what they want to do. Also invite them to participate in your business where they can. They can file, help you load the car, and plan the schedule. By involving them, they get a better idea of all you have to do, and you’ll also teach important life lessons about working hard and achieving your goals. Plan time away. Sure, work is important. But so is family, and it’s important to give yourself some distance as well, so you can come back refreshed. So plan times when you DON’T work. Even if it’s just a staycation. Just make sure there are blocks of time when you focus on priorities besides work. It will do wonders for you. By planning ahead, you will be much better able to balance work with the rest of your life, and enjoy every part of your life more. What tips would you give for helping people achieve work and life balance? Would love to read your thoughts in the comments!